Fr. Cornelius Scully was parish priest of Ballyclough, Kilbrin from 1830 until his death on 28th January, 1857 in his 60th year and 34th of his ministry. 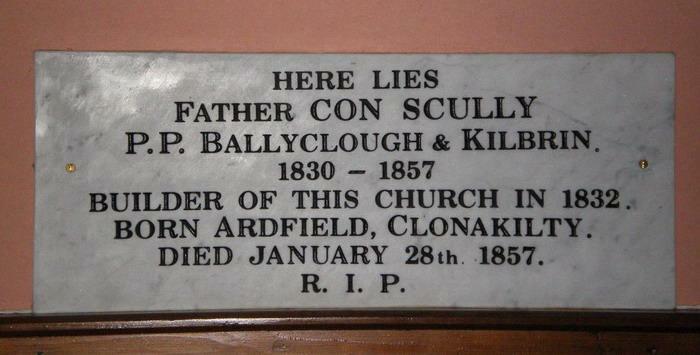 During that time the present churches in Kilbrin and Ballyclough were built, in 1832 and 1850 respectively. He is buried in Kilbrin church. Cornelius Scully was born in the parish of Ardfield, diocese of Ross, in West Cork. His parents were Patrick Scully and Catherine nee Daly. Patrick (Padraig óg) was an active member of the United Irishmen and took part in the Battle Of The Big Cross (Shannonvale) near Clonakilty in 1798. His Gaelic poem “Cath Beal Atha Mui ’Shealaigh" is the only eye witness written account of that battle; at least it is reputedly so. Padraig óg Scully had to flee Ireland in the early 1800’s leaving his wife and three young children in the care of his parents Sean Mór and Hanora. He lived in the Boston area until his return from exile in 1814. He died two years later on 22nd April, 1816. Fr.Scully’s mother Catherine outlived him. She didn’t die until 22nd February 1866. We know she lived with him at Ballymacpierse and at Ballyrushion. He had one sister Nellie who died 7th May, 1857 and one brother Michael who died 15th October, 1886. Nothing is known to this writer of Cornelius’ education. It is known, however, that he was ordained before 1824 for the diocese of Ross. At that time the dioceses of Cloyne & Ross were united. Fr.Scully’s first appointment was curate in Cobh. In 1824, the Catholic Association sought submissions on the numbers of Catholic schools in each parish. Cobh was among the parishes that forwarded returns. These were compiled by Rev.Cornelius Scully. The text of his submission was published in the Southern Reporter, 6 May, 1824. In a letter to his grandfather written in Cobh, June 22nd, 1828, Fr.Scully states, “We are fighting the battles of the Lord with the Biblicals and are defeating them in all directions". As you will notice, this was before the National Schools Act (1831). The Kildare Place Society offered free places in their Protestant schools to poor Catholics. Sometimes this was seen as Proselytism. To counteract this behaviour, Dr.Coppinger, Bishop Of Cloyne and Ross, residing at Mt.Crozier, Cobh, decided to erect free schools in Cobh in 1829. Fr.Cornelius Scully and Fr.Matt Horgan, the famous parish priest of Blarney, were asked by the Bishop to arrange the provision of a suitable site, the drawing of plans and to oversee the construction. In February, 1829, Frs.Scully and Horgan met the landlord, Mr.Smith Barry and his agent Mr.Reeves at Fota and asked him for a site for new schools for the education of the poor of Cobh. We are told they were received respectfully, though Mr.Smith Barry did make some objections to Fr.Scully for opposing him sometime before at a meeting in Cobh and, also, for inducing his Tenantry to vote against him at the Coroner’s election. However, he had no objection to the education of the poor and granted permission to quarry on his property, wheresoever the school—houses may be built and moreover was rather inclined to grant the site, provided it did not interfere with his new plan of improvement. Sometime later, Fr.Scully met with Mr.Reeves to inspect Mr.Smith Barry’s plan in order to pick a spot that would not interfere with his intended improvements. Immediately, Fr.Scully got separate plans drawn up by the Monk, Mr.Riordan in Cork and Fr.Matt Horgan. It gradually became clear that Mr.Reeves was not an advocate for the education of the poor, so it came as no surprise when Smith Barry refused to grant any ground for the school "finding it so likely to interfere with his new intended improvements for Cove". Dr.Coppinger then requested Fr.Scully and Mr.Cunningham to go to Lord Midleton’s agent, Mr.Poole, and apply for a site on his estate near the town. Not getting a reply, Frs.Scully and Horgan went to Mr.Poole again and presented a plan drawn by Fr.H0rgan and Mr.Cottrell, Architect. This plan was forwarded to Lord Midleton "with a powerful recommendation not alone of granting the ground, but moreover to subscribe £50 to such a fine improvement on his Estate." Even though work had commenced on a certain site, Lord Midleton refused Dr.Coppinger’s request. Though refused by two landlords, Dr.Coppinger was determined to build free schools in Cobh. He asked Fr.Horgan to draw plans to build in the chapel yard. Fr.Scully laid the Foundation Stone on the 17th May, 1829. He organised the collection of materials by getting the farmers to give horses and the boat-owners to give their boats for the transportation of gravel. “On this occasion there was such emulation and enthusiasm that some persons who never had a horse paid the hire to send one". All the Protestants freely helped. The schools were built by October and the Bishop publicly thanked Fr.Scully’s unequalled zeal, patience and perseverance. A few months later, Dr.Coppinger appointed Fr.Scully Parish Priest of Kilbrin and Ballyclough. He said his first Mass as P.P. in the old chapel of Kilbrin on 10th January, 1830. On 26th May, 1831, Fr.Scully got a lease of Kilbrin chapel ground from Messrs.Joseph Freeman and John Purcell, to build a church, a priest’s house and a school for one penny a year for ever. The Church was built in 1832 and the priest’s house later. The school was built in Ballygraddy in 1843. A lease for this school-house was given by James Murphy to Rev.C.Scully, Charles Daly and Thomas Sheehan for 999 years at one penny a year. Following the account of his work in Cobh, it is not surprising, reading a letter he sent to his brother Michael, to see how strong—willed a man he was. The letter was written after Catholic Emancipation and he told his brother to become a scholar so that he may fill a higher place in society. He directed him to hire a teacher, pay him ten or twelve pounds a year, let him live in the house if necessary, but always learn from him "and if you do this, you will find that in twelve months you’ll be a scholar and thus too a gentlemen forever". He threatened not to write to him anymore if he refused to follow his advice having offered to pay the teacher’s salary. Irrespective of` his brother’s decision, he would always write to his grandfather. He enclosed £1-10 in gold to buy tobacco for his grandfather and grandmother. The grandfather lived an exceptionally long life. He was 115 years old when he died in June, 1844. In writing to his sister-in-law, after the grandfather’s death, Fr.Scully mentioned that the Bishop’s visitation prevented him from going to the funeral. He had returned from visiting his grandfather in Ardfield just a week previously. On his return he was called upon unexpectedly to preach in Doneraile Church in the Bishop’s presence. He didn’t state the nature of the occasion, just that he never saw such a crowd of people in the Church and outside the door in the chapel yard. He boasted about being heard across the street and being complimented by the Bishop publicly and by so many clergy and laity. He also mentioned that Patrick heard him preach. This seems to be his oldest nephew who seemed to live either with him and his mother, or nearby, to be educated. Mrs.Catherine Scully, the priest’s mother, wrote to her son Michael from Ballyrushion on 3rd October, 1837 outlining some difficulty Fr.Cornelius had with Mr.Freeman, his Landlord, in Ballymacpierse. It appears that Fr.Scully and another family had a joint lease on thirty acres. The family seemingly fell behind with their rent and just disappeared from the area overnight. This left Fr.Scully in an awkward situation, as no Parish Priest could have or take more than fifteen acres as a farm without the Bishop’s permission. Fr.Scully tried explaining this to Mr.Delacore, who was Mr.Freeman’s agent in Mallow, who refused to accept Fr.Scully’s rent for fifteen acres saying that the whole of the thirty acres should be ejected as it was a joint lease. Mrs.Scully was very upset that this happened with all the crops in the ground. She said “the priest then took legal advice from Mr.Charles Daly, the Attorney who lives in the parish, who is son of Mr.Charles Daly of Lackeel, at whose house the priest once lodged”. He gave him £1-10-0 to defend or secure the crops. He was not fully satisfied so he sought further advice from his old acquaintance and friend in Mallow, Mr.Richard Jones, Attorney & Coroner who for £2-0-0, secured his crops and put a stop to the law proceeding for the time being. Meanwhile, Fr.Scully and his mother were offered several houses by Catholics and Protestants, e.g. the widow Twinan and the widow Curtin of Ballymacpierse, one of his own Catholics. A gentleman from Castletreasure near Cork came down expressly and offered Fr.Scully a place -14 acres, 1/2 quarter and 3 perches for £1-4-0 per acre. The house was a small thatched house in need of repair, which could cost fifteen pounds or more. The house in which the late Mr.Egan lived was the second next house to Mr.K.Twomey the tailor, on the Ballyrushion road. The land is up to Sir.Henry Beecher’s demesne on the east and bounds the parish of Castlemagner on the South and Leahy’s lands at Subulter and on the South West, West and Northwest it is bounded by the middle road leading to the widow Curtin’s at Ballymacpierse. It is only separated from the priest’s former place by Mrs.Twinan’s farm. She continued about times being hard and the priest (her son) had stopped getting the newspaper from Cork as he thought it too costly and in, fact, the priest was not at all well in his health, she said. Yet, she proudly said that she and everyone around thought the priest “acted most properly and independently in showing good example notwithstanding his losses in refusing to pay £2-10-0 on acre rent". The song in praise of Fr.Cornelius Scully says he attended many anti-tithe meetings and addressed thousands with great wit and eloquence. Fr.Cornelius Scully was undoubtedly a strong willed man and a great leader, who was ordained before Catholic Emancipation, who built the Coppinger free schools in Cobh, the Church in Kilbrin within two years of his arrival to the parish, and the Church in Ballyclough immediately after the Famine. He died at the age of 60 in 1857 and is buried in Kilbrin Church. My thanks to Fr.J.Coombes P.P., Timoleague, who directed me to the Scully papers and the Journal of the Cork Historical & Archeological Society, 1962, pp.89—103.